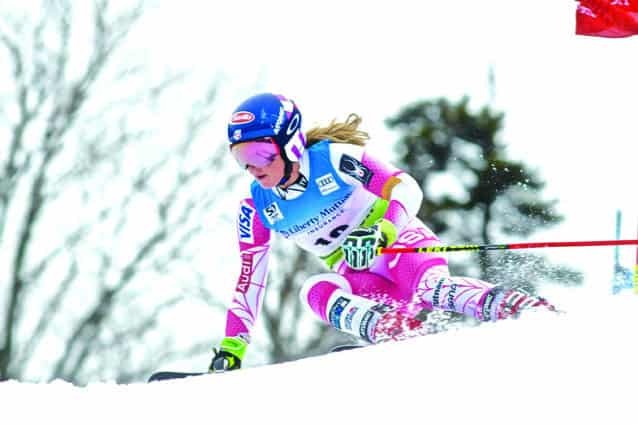 Some of the fastest female ski racers in the world will again be carving turns down Superstar at Killington Resort, Mike Solimano, resort president announced Monday, April 3. The FIS Ladies World Cup Slalom and Giant Slalom races are expected to return to Killington Resort over Thanksgiving weekend 2017 and 2018. Killington plans to enter a two-year race agreement with USSA to bring World Cup racing back, however, it’s place on next year’s World Cup calendar is will not be officially confirmed until the International Ski Federation (FIS) meets in Portoroz, Slovenia in late May. Pending FIS approval, the next World Cup at Killington would take place Nov. 25-26, 2017. “We wanted to announce to the community first,” Solimano said, who made the announcement at a summer kick-off event at the Killington Grand Hotel on Monday evening. The news, which had been rumored in the previous weeks picking up credibility after the Aspen Daily News announced that Aspen would not host the race due to needed infrastructure improvements at the resort. Confirmation of the news that the World Cup will indeed return to Killington elicited very positive reactions from the community members in the audience, with hoops and hollers and a long-lasting round of applause. “Establishing a multi-year World Cup schedule here at Killington is an incredible opportunity to bring even more visibility to the resort and our community, which has been extremely supportive of our efforts to bring these races back. I was blown away by the sheer size of the crowd last year, and the enthusiasm I witnessed leads me to believe that we’ll bring in even more spectators this year to watch the fastest female ski races in the world take on the Superstar trail,” said Solimano. When the resort hosted the World Cup last year, the event attracted 30,000 spectators—many times more than other early season races held worldwide. The event at Killington over Thanksgiving 2016 marked a return of World Cup ski racing to New England after a 25-year hiatus and a return to Vermont after 38 years. The event was also a huge boost for business and helped kick off the early winter season. Killington’s World Cup races in 2017 will be followed by races in Beaver Creek, Colo., not long after. Those two events will be the only to take place in the U.S.A. next winter season, according to Rob Megnin, director of marketing, sales and reservations for Killington and Pico. “We have a blueprint for successful races to build on, and we are going to throw a party you don’t want to miss,” said Herwig Demschar, chair of Killington’s World Cup Local Organizing Committee and VP of International Business Development at Powdr. Solimano said the race raised the profile of skiing in the East and at Killington, but was an expensive endeavor. The resort and its parent company Powdr Corp have been working on ways to make the event more sustainable for the future. The race came to a net cost of $1.2 million, according to Solimano. One of those ways is local support. On Town Meeting Day, Killington residents approved a town budget that included $100,000 to help cover hospitality costs associated with the race. Should the race not take place, it will remain in the town’s general fund. Mikaela Shiffrin carves down Superstar at Killington Resort during the 2016 World Cup GS race.